*Sigh* I’m so far behind in blogging, but I’ve still been baking! I’m knocking out my Someday List one by one! 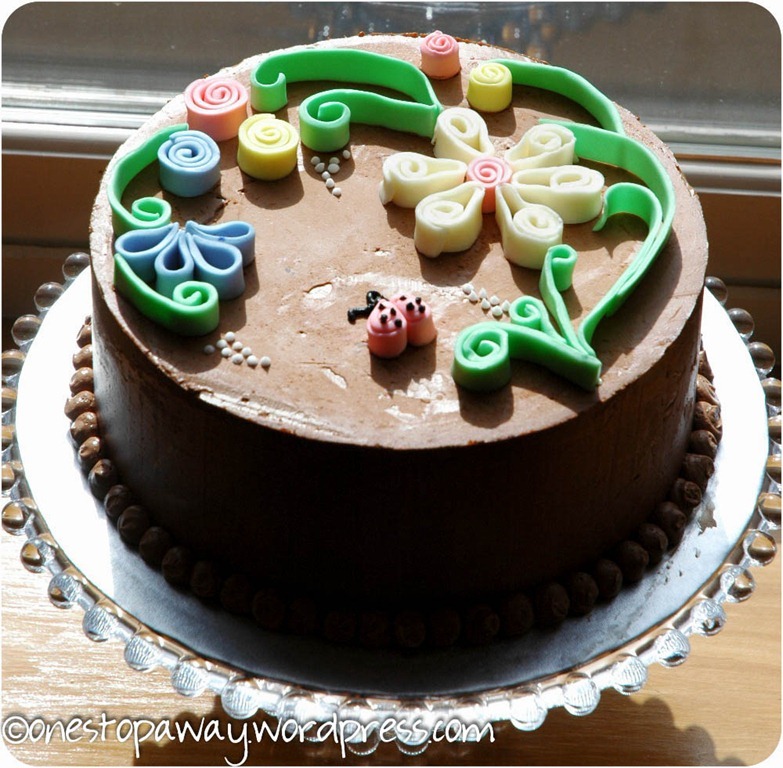 I’ve been doing a lot of chocolate cakes, and this cake continues the trend. What can I say? I do have other types of cake on my agenda, but this cake HAD to be chocolate. It was a birthday cake for my mom, and that’s just how we roll. Personally I’m of the opinion that if chocolate is one of your choices why in the world would you pick anything else? In my defense I have been trying different chocolate cake recipes. Like I said, this was a birthday cake for my mom. I thought about doing a white cake, but who am I kidding. When I mentioned it to my mom there was a good five seconds of silence on the phone. LOL There’s one person in my immediate family who prefers white cake, but she’s just going to have to wait for HER birthday. My sister suggested a Nutella® filling et voila! A chocolate hazelnut truffle cake is born! I chose to use a chocolate Swiss meringue buttercream. It truly is worth the effort. It’s much easier to spread and work with. Some people prefer the taste, as it’s not as sweet. Plus it’s much easier to smooth and get sharp corners. Disregard the over exposed flowers on top and check out that sharp corner and smooth sides! I LOVE working with Swiss Meringue, but I’ve found that it’ all a matter of preference. You’ll be hard pressed to find any two bakers with the same recipe or technique. 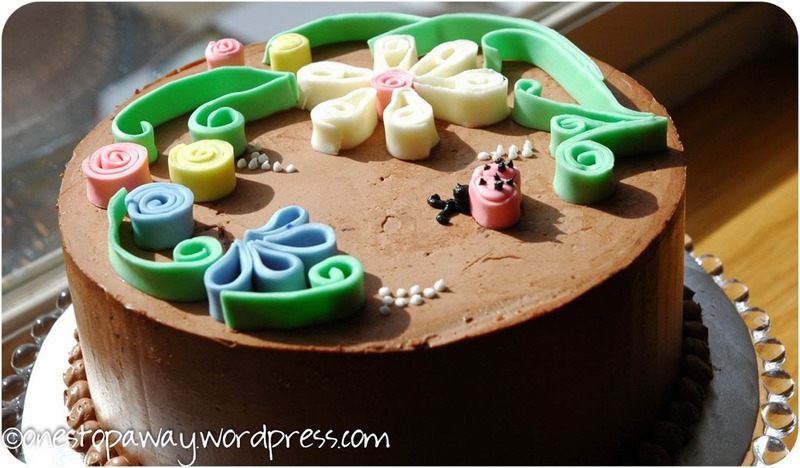 My first time working with it was for this cake, and I followed Whisk Kid’s recipe to a T with no problem. Then I found this recipe last fall, and I’m in love. Seriously. Time consuming? Yes. Completely awesome and worth every second, every minute you put into it? Why yes, yes it is. The technique I used to decorate the top is quilling. 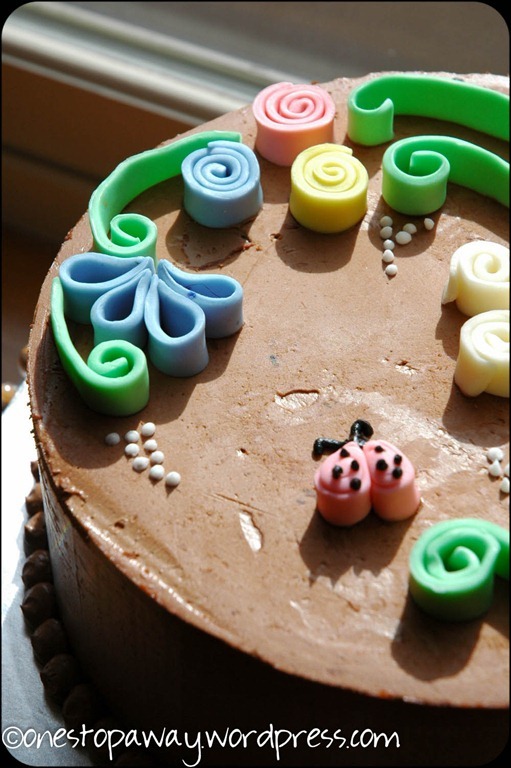 The design and technique I used can be found here at MyCakeSchool. I don’t know what I was expecting, but this was remarkably easy to do. Next time, though, I would let my strips of fondant sit out a bit to stiffen a bit before working with them. Mine were a bit soft to work with easily, and I had a hard time trying not to smoosh (yes, that’s the real technical term) my swirls together, but this technique leaves a lot of room for error. Check out the technique and give it a try! You won’t be disappointed. In a medium bowl whisk together the cocoa and boiling water until smooth. Cool to room temperature. You may be will be tempted to lick your finger. Don’t. For the love that all that is holy, just don’t. Remember the scene in Big where Tom Hands tries caviar for the first time? That’s what I’m talking about. And you’re welcome. In another bowl lightly combine the eggs, 1/4 of the cocoa mixture and vanilla. In a large mixing bowl combine the remaining dry ingredients and mix on low speed for 30 seconds to blend. Add the butter and remaining cocoa mixture. Mix on low speed until the dry ingredients just until moistened. Increase to medium speed and beat for 1-1/2 minutes. Scrape down the sides of the bowl and gradually add the egg mixture. Do this in 3 batches, beating for 20 seconds after each addition. Scrape down the sides again. Put the batter into your prepared pans (I used two 8” pans) and smooth the surface with a spatula. Bake 25 to 35 minutes or until a toothpick or other cake tester comes out clean. Put cream cheese in a bowl and beat until smooth and fluffy. Scrape down sides and add the chocolate hazelnut spread and cream together. Add the cocoa powder and mix until combined. 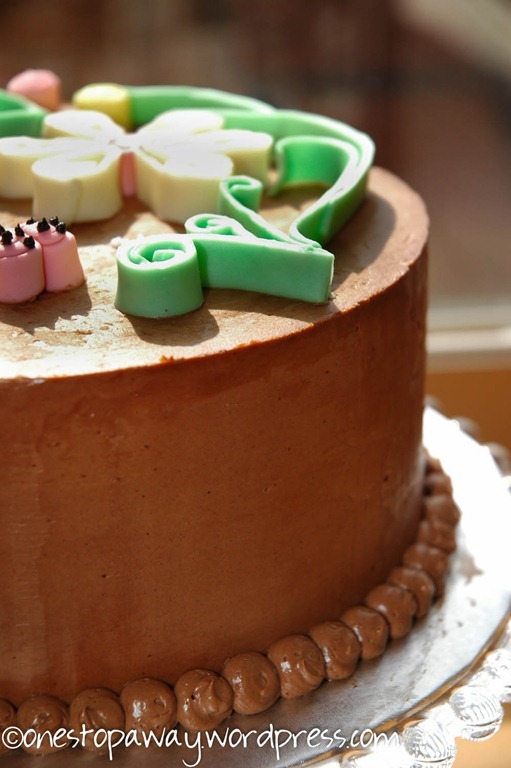 This recipe makes a lot of filling, much more than was needed for this 8-inch cake. So unless you have something else to do with the filling I would try to halve it. You’ll still have some left over, but not nearly as much. I always get behind in blogging if I have time to cook lots – as it happens it’s a struggle to find the time to cook. Oh well. This cake looks incredibly, very VERY well decorated. I struggle with the concept of making time for what’s important to you. As a mom to three kids my free time is often taken up with doing things for them. LOL Somehow it all seems to works out though. Thank you for your kind comment! luv it! i also prefer the swiss buttercream. American buttercream is so sweet. i find french buttercream too rich and fussy and italian buttercream gets a little tricky with incorporating the syrup. that’s why i luv the swiss one — it’s perfect on all fronts!